"Is it okay if I claim this case as mine, Senpai?" In the winter of 2117, a runaway vehicle crashes into the Public Safety Bureau Building. The driver is identified as Izumi Yasaka, a psychological counselor at the Sanctuary, a Latent Criminal Isolation Facility in Aomori Prefecture. But right before her interrogation, Enforcer Mika Shimotsuki and Inspector Nobuchika Ginoza are tasked with promptly escorting Yasaka back to Aomori. What awaits them there is a False Paradise. 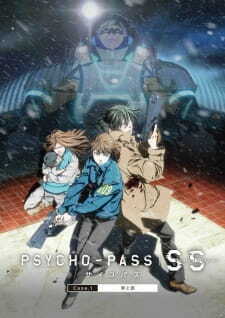 At 60 minutes, "Psycho-Pass Sinners of the System Case 1: Crime and Punishment" is less of a movie and more of a 3-episode bonus arc to Season 2 of Psycho-Pass. Our main focuses are Mika and Ginoza this time around, and fans of Ginoza/Mika can rejoice - they both get plenty of badass scenes, and Gino especially gets a beautiful fight scene towards the end. Make no mistake, however - this is Season 2-level writing, not Season 1-level. In other words, serviceable but nothing groundbreaking. Villains are pretty bland (though decently designed visual-wise), serving just as plot devices so the writers can make a point about society under the Sibyl System. The case is solved rather conveniently and neatly, and kind of predictably in all honesty. The high points are definitely the characters and the fight scene at the end. Mika finally feels like an actual Inspector with enough redeeming qualities to stand on her own. Ginoza's screen-time allows him to showcase further growth in his character since Season 1, and reveal his thoughts on the other characters. The fight scene at the conclusion of the climax gets deserved full praise from me. I was massively disappointed, however, that instead of getting new opening and closing songs after all these years, they simply remixed the OPs/EDs from Season 1/2. Remixes that somehow sound worse than the originals. So, a complete let-down on the music side of things. Overall, I enjoyed the movie and was glad to be back with the characters I fell in love with in Season 1, and kind of liked in Season 2. Definitely don't hype yourself up for the story though. And if you have to pay to see it (like I did in theaters), it may not be worth the price of admission unless you're a die-hard Psycho-Pass fan. Any info on the BD release of this Trilogy movie series? Release date speculation? So is this a sequel or a whole new thing? I need to know please..